In November of 2016, the U.S. Department of Education issued final regulations to implement provisions of the Every Student Succeeds Act (ESSA) regarding school accountability, data reporting, and state plans. 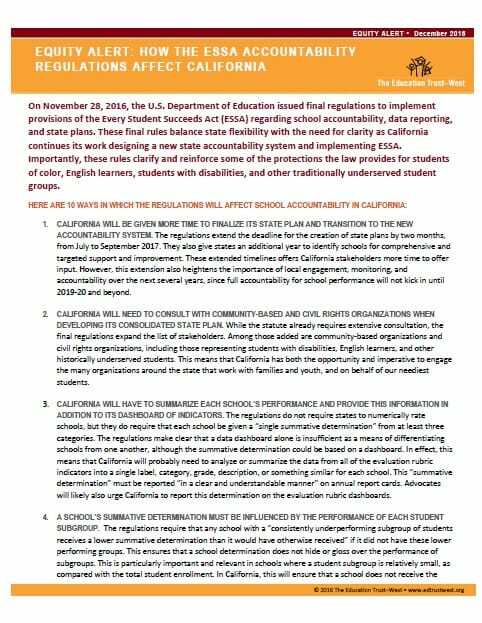 These final rules balance state flexibility with the need for clarity as California continues its work designing a new state accountability system and implementing ESSA. Importantly, these rules clarify and reinforce some of the protections the law provides for students of color, English learners, students with disabilities, and other traditionally underserved student groups. Download the full equity alert, and visit our Equity & Accountability: What You Need to Know page via the links below.